DAT-01345-00XX0 (2 Conductor) DAT-01345-00XX0, Two Conductor Data Cable. DAT-01345-02XXX (2 Conductor) DAT-01345-02XXX, Two Conductor Data Cable. DAT-01345-03006 (2 Conductor) DAT-1345-03006, Two Conductor Data Cable. DAT-01345-04010 (2 Conductor) DAT-01345-04010, Low Voltage Inhibit. DAT-01346-00XX0 (3 Conductor) DAT-01346-00XX0, Three Conductor Data Cable. DAT-01346-02XXX (3 Conductor) DAT-01346-02XXX, Three Conductor Data Cable. DAT-01346-04XXX (3 Conductor) DAT-01346-04XXX, Three Conductor Data Cable. DAT-01347-00XX0 (4 Conductor) DAT-01347-00XX0, Four Conductor Data Cable. DAT-01347-01XXX (4 Conductor) DAT-01347-01XXX, Four Conductor Data Cable. DAT-01347-02XXX (4 Conductor) DAT-01347-02XXX, Four Conductor Data Cable. DAT-01348-00XX0 (8 Conductor) DAT-01348-00XX0, Eight Conductor Data Cable. DAT-01348-01006 (8 Conductor) DAT-01348-01006, Eight Conductor Data Cable. DAT-01348-02XXX (8 Conductor) DAT-01348-02XXX, Eight Conductor Data Cable. DAT-01348-03016 (8 Conductor) DAT-01348-03016, Eight Conductor Data Cable. DAT-01348-04XXX (8 Conductor) DAT-01348-04XXX, Eight Conductor Data CAble. DAT-01348-07004 (8 Conductor) DAT-01348-07012, Eight Conductor Data Cable. DAT-01348-08014 (8 Conductor) DAT-01348-08014, Eight Conductor Data Cable. DAT-01348-09006 (8 Conductor) DAT-01348-09006, Eight Conductor Data Cable. DAT-01348-10014 (8 Conductor) DAT-01348-10014, Eight Conductor Data Cable. DAT-01348-12010 (8 Conductor) DAT-01348-12010, Eight Conductor Data Cable. DAT-01348-13010 (8 Conductor) DAT-01348-13010, Eight Conductor Data Cable. DAT-01348-15013 (8 Conductor) DAT-01348-15013, Eight Conductor Data Cable. DAT-01349-00XX0 (10 Conductor) DAT-01349-00XX0, Ten Conductor Data Cable. DAT-01349-01006 (10 Conductor) DAT-01349-01006, Ten Conductor Data Cable. DAT-01349-02006 (10 Conductor) DAT-01349-02006, Ten Conductor Data Cable. DAT-01349-03006 (10 Conductor) DAT-01349-03006, Ten Conductor Data Cable. DAT-01349-04006 (10 Conductor) DAT-01349-04006, Ten Conductor Data Cable. DAT-01349-05006 (10 Conductor) DAT-01349-05006, Ten Conductor Data Cable. 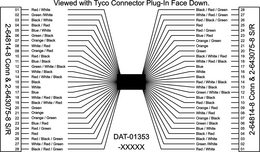 DAT-01349-06XXX (10 Conductor) DAT-01349-06XXX, Ten Conductor Data Cable. DAT-01349-07006 (10 Conductor) DAT-01349-07006, Ten Conductor Data Cable. DAT-01349-08006 (10 Conductor) DAT-01349-08006, Ten Conductor Data Cable. DAT-01349-09006 (10 Conductor) DAT-01349-09006, Ten Conductor Data Cable. DAT-01349-10014 (10 Conductor) DAT-01349-10014, Ten Conductor Data Cable. DAT-01349-11006 (10 Conductor) DAT-01349-11006, Ten Conductor Data Cable. DAT-01349-13006 (10 Conductor) DAT-01349-13006, Ten Conductor Data Cable. DAT-01350-00XX0 (15 Conductor) DAT-01350-00XX0, Fifteen Conductor Data Cable. DAT-01350-01006 (15 Conductor) DAT-01350-01006, Fifteen Conductor Data Cable. DAT-01350-02006 (15 Conductor) DAT-01350-02006, Fifteen Conductor Data Cable. DAT-01350-03XXX (15 Conductor) DAT-01350-03XXX, Fifteen Conductor Data Cable. DAT-01350-04006 (15 Conductor) DAT-01350-04006, Fifteen Conductor Data Cable. DAT-01351-00XX0 (25 Conductor) DAT-01351-00XX0, Twenty-Five Conductor Data Cable. DAT-01352-00XX0 (30 Conductor) DAT-01352-00XX0, Thirty Conductor Data Cable. DAT-01353-00XX0 (28 Conductor) DAT-01353-00XX0, Twenty-Eight Conductor Data Cable. 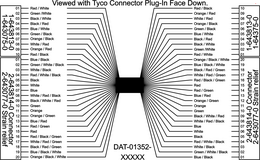 DAT-01354-00XX0 (18 Conductor) DAT-01354-00XX0, Eighteen Conductor Data Cable.